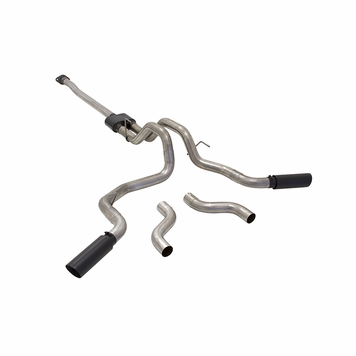 Flowmaster's Outlaw® Cat-back exhaust system for the 2015-18 Ford F-150 is perfect for the person looking for a very deep and aggressive sound level outside and inside the truck with all of the performance benefits that you would expect from Flowmaster. This exhaust is not for the faint of heart! 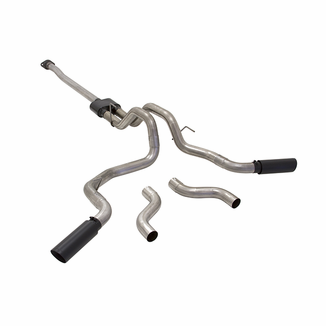 This bolt-on DOR/DOS (Dual Out Rear, Dual Out Side) emissions-legal system for trucks with the 2.7L/3.5L Ecoboost, 3.5L TiVCT and 5.0L V8 engines features a Super 10™ Series muffler and dual mandrel bent 3.00" tailpipes for maximum performance. The system is built out of 409S stainless steel and has 4.0" Black Stainless Steel Flowmaster® Embossed tips. The exhaust system is manufactured in the USA. Designed for an easy fit, this system includes all necessary parts and hardware for installation.